Yahoo’s overall business may be in trouble, but its sports news site has always been one of the best in the game. And this Thursday, during the NBA Draft, Yahoo Sports will get a chance to prove to the world that it has better reporting than ESPN, at least in terms of basketball coverage. Why? Because Adrian Wojnarowski, the star basketball reporter often called Yahoo Sports’ “best asset,” is live-streaming the event for the first time. For those not familiar with Wojnarowski, he’s easily the best NBA reporter in the business when it comes to breaking news. During the 2011 NBA Draft, he famously scooped more than half of the picks before they were even announced. In 2014, he broke more picks than all of the basketball reporters combined, as this Reddit user tracked during the draft. Perhaps that explains why Yahoo CEO Marissa Mayer personally convinced Wojnarowski to stay with Yahoo Sports, when he reportedly thought of joining Sports Illustrated instead. Yahoo also rewarded him with his own standalone basketball news site called The Vertical last year, which is where Yahoo’s NBA Draft live stream will take place. The NBA Draft live stream will also put Yahoo’s own video streaming capability to test, an area the company’s been increasingly focused on. It recently had the first-ever NFL live stream, while also live streaming the annual shareholder meeting of Warren Buffett’s Berkshire Hathaway. “Beginning at 7 p.m. ET live from the Yahoo studios in New York, Yahoo Sports’ The Vertical with Woj (WWW.THEVERTICAL.COM) will provide fans with breaking news on draft picks and trades, and exclusive interviews with newsmakers…Throughout the draft, we’ll check in with Woj, The Vertical’s Shams Charania and DraftExpress’ Jonathan Givony as they gather exclusive information on picks and trades from front offices around the league,” Yahoo wrote in a blog post. 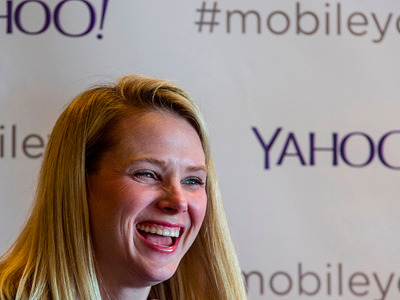 adrian wojnarowski advertising marissa mayer sai-us sportspage yahoo!